The NeuroSwitch helps people with ALS and quadriplegics communicate. This is what patients see after the device reads the body's electrical signal. 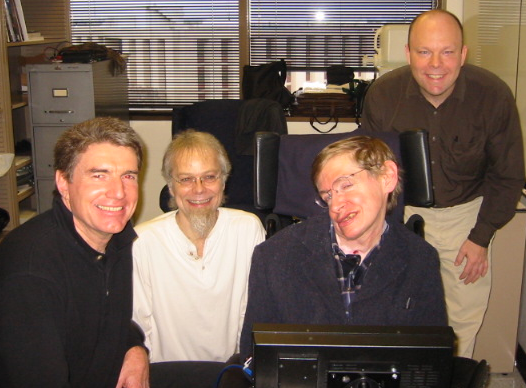 (from left) Peter Ford, Mark Britton, Prof. Hawking with James Schorey. The NeuroSwitch was installed on Hawking's wheelchair. The NeuroSwitch uses computer hardware and software to read the biological signals of the body and turns them into a communications tool so patients can speak, do email and surf the web. The NeuroSwitch costs about $17,000. The Veterans Administration and some insurance companies pay for it. Others do crowdfunding. Professor Stephen Hawking is one of many who have tested the NeuroSwitch.